Thirsty Pilgrim: A Beer to Hunt: Rodenbach Vintage 2007. Rhetorical question: If you had an exceptional oak tun in which you were aging some exceptional sour ale for a couple years, wouldn't you name it something besides Vat #230? I can't think of so many better names. Chewbacca! ... Zeus! ... Jenkins! Always liked that last one. But #230? That's so—I don't know—Short Circuit of them. 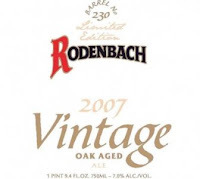 Anyway, the news: Rodenbach is releasing a special bottled beer in November called Rodenbach Vintage 2007. It appears to be an unblended sour ale from the aforementioned, imaginatively named vat. According to U.S. importer Latis, brewmaster Rudi Ghequire "describes Vintage as having a red copper glow with complex flavors but at the same time very smooth. Vintage is 7% ABV is [sic] more mild than Rodenbach Grand Cru." If it's really unblended I wonder why it's "milder" than the Grand Cru, which is somewhat diluted with younger beer these days. Could be #230's fault. It's a pretty mild name, after all. I reckon that's typical for a special release. Actually I think Belgium was lucky to get 10,000. It's easier to find certain Belgian beers in Springfield, Missouri, than it is in Brussels. 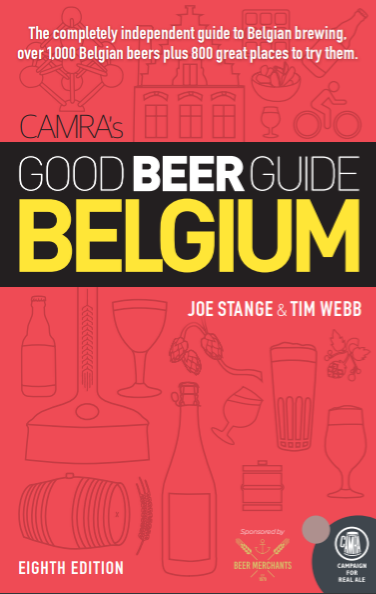 Shows you how much most Belgian breweries are dependent on the export market. I'm beginning to wonder how/when/if things will change due to economic downturns and ridiculous exchange rates. The US market helps keep a lot of Belgian breweries afloat. But back on topic - yay Rodenbach! I actually drank this with the CEO of Palm Breweries in NYC last night. There's 40,000 bottles total, 30,000 in the US and 10,000 in Belgium. The Beer is absolutely fantastic. It's much richer than the Grand Cru and worth every penny. America is just getting ready to appreciate this kind of beer and I think the 30,000 bottles could be gone really quickly. I plan on buying a few myself! If anyone doesn't know where to find this beer, wwww.holidaywinecellar.com has them for sale online for $19.99 which is a great price considering that thebelgiumbeershop.com wanted $80 a bottle. The Holiday Wine Cellar is based out of Escondido, California, but can ship to almost all states. From what I heard only 2 pallets (230 cases of 6) came to California and the Holiday Wine Cellar got 1 of them so I know that they have plenty to go around. I got 6 shipped to me and this beer is as AMAZING as I expected it to be. VERY smooth and full, sour and finely balanced - I suspect Vat 230 gets the roundness from the long oak aging. I also got unusual spice box and a hint of vanilla, which in hindsight might be the wood. Thanks for the note, JFK. Sounds lovely. This post has been getting some traffic lately, so I reckon a good portion of it must have reached U.S. bottle shops.